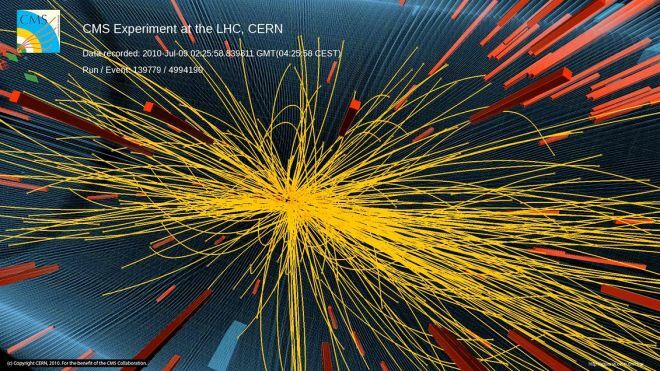 Higgs Boson announcement expected from CERN today | Watts Up With That? “The God Particle” may have been found. Scientists in Geneva are expected to announce they have caught a glimpse of the elusive Higgs Boson on Tuesday in a press conference planned for 8 AM EST. The particle is a vital factor in science’s understanding of the universe, but it has never been seen by scientists in any particle accelerator, perhaps until now. The theory of its existence goes all the way back to 1964. Finding the Higgs Boson is one of the main goals of the $10 billion Large Hadron Collider (LHC) which recently started operation amidst worry that the search for the HB might open a rift or create a small black hole. If scientists have gotten a glimpse of the Higgs, it could have far-reaching consequences in particle physics. It is the only particle predicted by the current favored theory of particle physics that has not yet been observed experimentally. Its discovery would likely validate the Standard Model theory. The Higgs boson is often referred to as “the God particle” by the media, after the title of Leon Lederman‘s book, The God Particle: If the Universe Is the Answer, What Is the Question? Lederman initially wanted to call it the “goddamn particle,” but his editor would not let him. I’m sure our physicist friend Luboš Motl will have some coverage at The Reference Frame once the announcement is made for us folks that are three quarks shy of full set of fermions. ATLAS and CMS have presented an important milestone in their search for the Higgs particle, but it is not yet sufficient for a proper discovery given the amount of data recorded so far. Still, I am very excited about it, since the quality of the LHC results is exceptional. The Higgs particle seems to have picked itself a mass which makes things very difficult for us physicists. Everything points at a mass in the range 115-140 GeV and we concentrate on this region with our searches at the LHC and at the Tevatron. The results indicate we are about half-way there and within one year we will probably know whether the Higgs particle exists with absolute certainty, but it is unfortunately not a Christmas present this year. The Higgs particle will, of course, be a great discovery, but it would be an even greater discovery if it didn’t exist where theory predicts it to be. This would be a huge surprise and secretly we hope this might happen. If this is case, there must be something else that takes the role of the “standard” Higgs particle, perhaps a family of several Higgs particles or something even more exotic. The unexpected is always the most exciting. That’s not enough for a “discovery” (which techically needs 5 sigma) but it is very interesting evidence for the Higgs. Fabiola Gianotti has finished her presentation. So far,we know that Atlas seems to have found evidence for a bump around 126GeV for something that looks like the Higgs. How science has changed…doing some searching on the Atlas experiment, I came across this commercialization of the science at the Atlas store. At least they aren’t offering Pecan logs. Oh wow! Proper science with proper probabilities. Congratulations to all at CERN. It’s been a long wait but well worth it! Thanks for thinking about this discipline, Anthony! Bet: If they have found this one they’ll have to find the next. Don’t know why I always thought they would not find it, but, this will be interesting. During the 70s through early 90s I was always stuck to this “particle physics” tube waiting for the next shattering breakthrough. I didn’t quite get the gist of that CERN animation. Is there some particle exchange mechanism involving the Higgs that does the curving of spacetime? I mentioned on a couple Facebook posts that this could be a “massive” announcement. Particle Physics (well actually the technology of it) was my first love. I built a Cyclotron in the EO Lawrence style for my high school science project that went to the National Science Fair. Powered by my dad’s DC arc welder, it was a noisy and somewhat fearsome bugger to operate. I was confident that no such particle existed. Here’s why. It was an idea that came out of left field by Peter Higgs in the sixties to answer the question why particles have mass – ie inertia. Since there was nothing in the standard model that provides an eplanation, Peter put forward the idea that inertia is the observed effect of an undiscovered field, named the Higgs field. He believed that it is particles moving through the Higgs field that gives the appearance of inertia. This gave rise to the realisation that if there is a Higgs field, there ought to be a corresponding particle. This is because in the standard model all fields are associated with particles that carry those fields. The particle that carries the electo magnetic field is of course the photon. The problem I have is that such a field is a return to the theory of the aether. This was discredited by Einstein – if you have an aether, then that implies an absolute space, an absolute frame of reference against which all other frames can be measured. It also appears to violate Newton’s first law of motion, since it would imply that if particles are interacting with a field that is responsible for their inertia, then those particles should not continue to move in a straight line at constant velocity unless acted upon by an external force. They may well have discovered a new particle, but does it mean that the Higgs field exists? That is the question. If they have found it, I will give the EU 6 months before they tax it. Luminiferous aether was unfashionable when it was just an understandable energy field. By defining it as a “particle” which can only be observed by elite physicists commanding billion-dollar research budgets, it becomes fashionable again. Sort of like outhouses. When they were wooden shacks that any old peasant could build, they were unfashionable. Now that they’re highly expensive Carbon-Neutral Composting Toilets, requiring special EPA permits, they’re haute enough for San Francisco. The Godot particle seems a better name! Have they sorted out the “time-travelling” particles yet? Is it real or is just satellite drift causing a misreading? Now that is science. We also recently had from CERN the results of the CLOUD experiments, led by Jasper Kirkby. Can CERN give these results as much exposure as the Higgs Boson will get once it is dedected? These are both very important to humaniy, the former is becasue it boosts standard model theory, while the second will pull the carpet from beneat the greatest scientific scam ever concocted and save the tax payers trillions of dollars/euros/yen, money that can be utilised to further enhance the quality of our lives. I miss the bubble chambers! The stream on the site isn’t working well. I hear the perimeter institute for theoretical physics is doing a live interactive chat with some of the physicists involved with the experiments later today at 12:30 est its on their site at http://www.perimeterinstitute.ca. people who don’t eat enough…Higgs-challenged persons? people who eat well enough…Higgs-aholics? people who suffer food allergies…Higgs-intolerant people? people who exercise too much…Higgs-deficient folks? Watching the streaming video, now, and I get the distinct impression that the CERN folks are trying to justify their continued budgetary existence. No Higgs, yet, but things are looking good for something in the future. This seminar is primarily to note progress on the project. Very interesting. And I’m happy to see they are open to the possibility the Higgs boson doesn’t exist rather than insisting it does exist and they just haven’t been looking in the right place. I don’t remember Einstein discrediting the theory. I remember Michelson-Morley running the experiment using an interferometer, mirrors and a big vat of mercury. I’ve got a bottle of them somehere in my workshop. I would uncork it and look inside, problem is catching the durned thing. So if you believe in the “God Particle” your an Aetherist. I wonder if they had to use dodgy statistical techniques to fit the data to their a priori assumptions? Or select data that gave them the answers they were looking for? Or had to ‘Hide-the-Decline’ when the data didn’t do what they wanted it to? Or are they real scientists who let the real data speak for itself? It arises as a consequence of Einstein’s description of space and time. Pre Einstein, it was thought that space and time were absolute. In other words, it would be possible to define a universal frame of reference against which all other frames could be measured. This was what Michelson-Morely were trying to do – measure the aether drift. Einstein realised there could be no such thing as absolute space or time. It was impossible to define a motion without explicitly stating what frame of reference that motion existed in. Any reference to “the aether” must logically reintroduce the idea of absolute space. Whether or not the Higgs field is viewed as permeating all of space like the aether, is not made clear. Read it and weep, Mann and Jones. Now here is a proper scientist – he even seems to think that not only is the science not settled but it would be even more exciting if the theory is wrong! “But perhaps one of the biggest benefits of the current excitement will be this: watching the twists and turns of the neutrinos or the Higgs might, just might, help us as a society to become better equipped to make sense of other scientific issues, which are more politically and economically charged. MMR, stem cell research, climate change, GM foods: which way would you bet? Clearly, a discovery as important as the retrograde motion of planets. The Higgs, if found, is NOT the aether. Also, not Einstein discovered that there is indeed no aether, but the Michelson Morley experiment. And Einstein is reported to have said that he wasn’t even aware of MMs experiment when he set out. The aether was thought to be an ultra dense, yet ‘super-fluid’ (?) substance, through which all other matter moves with no friction/resistance at all. And it is not there, as we know from MMs experiment. Even empty space would have been jam-packed with aether matter, but Higgs is where we see/have mass, as it is thought to be associated with it. Isn’t it refreshing to see real scientists presenting their current work in a humble manner, with an emphasis on the limitations to what can be said at present. Yes, more work is needed – they have obviously been pushed in front of the MSM a bit here because people want answers. It would be nice to think that a few people outside science might finally get the idea that science is not about simple, settled answers. It will be interesting to follow this to the end of their hunt. Of course, it would be much more fun for physicists if they haven’t actually found anything, so that a lot of ideas would need an awful lot more work! it stands to reason – or at least – inference, that if a perfect vacuum were created in a laboratory, then if there were no matter left in a chamber, the interior of that chamber would be absolute zero. Although it is well nigh impossible to create this perfect vacuum in a lab, there is some energy field in this “vacuum” – so a vacuum is a rather redundant concept – nature abhors a vacuum. For a signal to be considered statistically significant in particle physics, it must be at least 5 sigma. The history of HEP has plenty of tantalizing 3.5 sigma signals that later turned out to be background as more data was accumulated. What really would be interesting to read, is a discussion on how the existense of a Higgs-particle comes into conflict with the “Ensteinian universe”. Would’nt that be an interesting blog-issue for our own Lubos Motl? If we believe in the existence of the Higgs-particle, what do we have to “say no to” in the “Einsteinian Universe”? I can see it is mentioned above, but I want more! Lubos? 1) You cannot prove a negative. 2) Einstein entertained his own Aether theory before giving it up for relativity. 3) Dayton Millers experiments were far better than MM’s, and Einstein knew they were a threat to his theory. I leaned in a similar direction. The excitement is justified, but it will be some time yet, before physics can declare the HB. Conclusions are premature. The devil is in the details. Still waiting, as I am, for how they broke the speed of light! Maybe, perhaps etc! Imagine that. A scientist that hopes the accepted standard theory will be proven wrong, using carefully constructed experimentation, because there is an acknowledgment that we might not know everything we think we know. Fabiola Gianotti, an Italian physicist who heads the team running the so-called ATLAS experiment, said “the hottest region” is in lower energy ranges of the collider. She said there are indications of the Higgs’ existence and that with enough data it could be unambiguously discovered or ruled out next year. Several mass or energy ranges within the atom smasher are now excluded to a “95% confidence level,” Gianotti told other physicists at CERN. . . .
One experiment, known as Atlas, suggested that the hypothesized Higgs is most likely to have a tiny mass, in the range of 116 to 130 gigaelectronvolts, or GeV. The other experiment pegged mass at 115 to 127 GeV. The experiments were carried out at the European particle physics laboratory CERN near Geneva. This gives me a hadron! Whatever exactly it is that they may have caught a glimpse of, a large part of me would still like it not to be the Higgs boson, just so’s physicists would have to get working on a replacement for the Standard, but not very Satisfactory, Model. I still don’t understand. Surely a single, universal (Higgs Field) frame of reference violates Special Relativity, in the same way that the “aether” would have done (until disproved by Michelson and Morely)? What am I missing? Tallbloke: Good to see you are considering the electromagnetic perspective of solar system physics. Regarding the announcement: Be reasonably sceptical, but have an open mind to the presented evidence. In the current state of Big Government Physics, be wary of pronouncements that confirm long-held theoretical physics. Because there is tremendous political pressure to confirm those long held beliefs and therefore there is a strong tendency for “confirmational bias”. In other words, to find what one is looking for. Pardon me for saying this, but after ‘climate science’ I just can’t seem to gain much interest in anything that carries a label ‘science’. The problem with the search for the Higgs Boson is that it has a foundation in the belief of the big bang theory. This theory like many before it is an anthropogenic conceit. Just as we wanted the earth to be the whole universe, or the centre of the solar system or our solar system to be the centre of the universe, big bang theory says more about us than it does about the true nature of the universe. We cannot cope with a “snap, crackle and pop” universe that continues in an infinite cycle oblivious to our irrelevant existence. Give us red shift and confirmation bias kicks in. We can believe in a universe with a beginning, middle and end. A universe that follows a cycle just like us and everything we know around us. How comforting. The harder they collide the particles together and the better they build detectors, the greater the number of shorter lived particles they will detect. Infinite complexity will exist at the fractal boundary between energy and matter. Perhaps a parallel and possibly more useful area of research would be to try to create matter from colliding energy. Short lived particles at first and eventually hydrogen. Just how does the energy emitted from what scientists call black holes condense to form new matter? is another which states that this has already happened. The pictures came to the attention of writer Sir Arthur Conan Doyle, who used them to illustrate an article on fairies he had been commissioned to write for the Christmas 1920 edition of The Strand Magazine. Conan Doyle, as a spiritualist, was enthusiastic about the photographs, and interpreted them as clear and visible evidence of psychic phenomena. Public reaction was mixed; some accepted the images as genuine, but others believed they had been faked. Congratulations to myself for having predicted the outcome. Perhaps a parallel and possibly more useful area of research would be to try to create matter from colliding energy. Short lived particles at first and eventually hydrogen. This is precisely what CERN is doing. Matter and Energy are equivalent [E=mc^2], one can be created from the other and vice versa. According to this guy, Dayton Miller and Michelson-Morley got “non-null” results. Here’s a project for a Physics class, review Michelson-Morley, Dayton Miller, and the “Shankland” paper. Since discussion of the Higgs bosun brings up the subject of inertia, an alternative to the Standard Model is Mach’s Conjecture, specifically the formulation, “inertia originates in a kind of interaction between bodies”, leading to the Woodward Effect. Woodward claims to have achieved 1 micro-newton of thrust from his apparatus, which at least has the virtue of not costing hundreds of millions of dollars. Does this mean that there will be a 20th adjustable parameter added with the “hocus pocus” (Feynman) of “renormalization”? If every particle has an “anti-particle”, as a matter of accepted theory, then is there not a theorized “anti-Higgs” particle, and from that an implied “anti-Higgs field”? I have not heard that anyone has a solid theory on the issue of “dark energy” accounting for the accelerating expansion of the universe. Could an anti-Higgs field act as dark energy? “LaForge to Captain Picard! I’ll have the warp engines back online in less than two minutes, Captain!” Interesting times we live in. Higgs bosons. Warp drives. Dark matter and dark energy. My dad was a small child when the Wright Brothers flew in 1903 and saw Armstrong and Aldrin land on the moon. Interesting times, indeed. What they also hope to find at Cern is mass dissappearing. That the sum of the bits will weigh less than prior to collision as mass has dissappeared into another dimension…and it’s information (what ever that is). Merry Christmas everyone. …and you thought the scriptural account of christ dissappearing while sitting eating a meal with his disciples was impossible(which it is at our current level of knowledge). But your would have said nothing could dissappear (it’s mass)..into another dimension not long ago as well. Watch this space. uninformedLuddite – Ah! The great Douglas Adams again. The problem with the search for the Higgs Boson is that it has a foundation in the belief of the big bang theory. This theory like many before it is an anthropogenic conceit. Just as we wanted the earth to be the whole universe, or the centre of the solar system or our solar system to be the centre of the universe, big bang theory says more about us than it does about the true nature of the universe. No, this is precisely what CERN are not doing. They are colliding protons which have mass and observing the short lived particles and energy produced in the collisions. While this will lead to better understanding of the semi stable state of energy we call matter, it is not a direct attempt to create semi stable matter from massless electromagnetic radiation. The “vice versa” you mention. To properly consider the creation of matter from energy it may be best to abandon the big bang theory and its proposed special initial conditions. Rather consider the “snap, crackle and pop” universe in which energy is neither created nor destroyed but matter is constantly created and destroyed. While creating semi stable matter from electromagnetic radiation alone in a hissing sea of vacuum energy may be beyond our present abilities, empirical experiments could still be conducted in that area. A high power gamma source could be targeted at the epicentre of the hadron collider proton collisions. If the same quantity of particles were created with a larger mass and longer lifespan, this would be a step in the right direction. If the mass of short lived particles is indeed greater than the mass of protons involved in the collision, then I would concede that CERN are creating matter from energy. This however does raise the question of “seeding”. The mass and velocity of the protons bring energy to the collision, but do the number of short lived particles produced exceed the number of subatomic particles brought to the collision? I stand corrected and amazed. do the number of short lived particles produced exceed the number of subatomic particles brought to the collision? Yes, two particles [protons] collide and hundreds or thousands of new particles are created from the energy of the speeding protons. The hope is that one or more of those would be the Higgs. I can’t wait to see where the Higg’s field leads in terms of implications for physics and the universe. What kinds of technologies can be developed for it? How will we come to a deeper understanding of time, space and other dimensions when it becomes more tractable and observable. 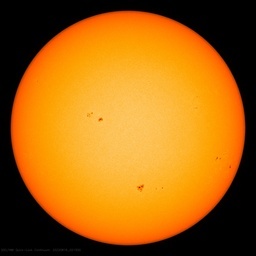 Can’t wait to see…in the meantime, my imagination will fill in the blanks – for better or worse! Search feverishly for Higgs Boson sprites inside her. but confirmation of the God Particle remains hazy! Could it be God is a Higgs Boson Denier? The problem with the search for the Higgs Boson is that it has a foundation in the belief of the big bang theory. This theory like many before it is an anthropogenic conceit. You are 100% correct. Glad there are still rational people out there. There is no Higgs’ Boson, and it will never be found. I am 100% sure, because the Big Bang theory is an obvious lie. The farther they will look using better telescopes, the more galaxies they will see. The ubiquitous red shift is nothing but an effect of the curvature of the space-time. Keep in mind that it isn’t only space that is curved; time is also curved, and on the scale of billions of light-years it’s curvature becomes noticeable. No need for demonic energy and evil invisible matter. Objects in the curved mirror are closer than they appear. Aether physically occupies three dimensional space and is physically displaced by matter. The aether displaced by the solar system is pushing back and exerting pressure inward toward the solar system. The pushing back and pressure exerted inward toward the solar system is evidence of the aether. The pushing back and pressure exerted inward toward matter by aether displaced by matter is gravity. In de Broglie wave mechanics the particle is in continuous energetic contact with a hidden medium. This energetic contact with a hidden medium is the state of displacement of the aether. A moving particle has an associated aether displacement wave. In a double slit experiment the particle has a well defined trajectory which takes it through one slit while the associated aether wave passes through both. – science is after all the pursuit of natural explanations of reality without resorting to super-natural explanations. – but that’s another story! Thanks Leif, I’ve reposted your comment here. All input welcome to this open debate. This has nothing per se to do with the big bang [although the same process worked them: the energy released from the false vacuum was converted into particles which then were annihilated to create radiation again, leaving only a small residue [one in a billion] of particles to make up you and me]. What is a ‘false vacuum’? Delusion is the ongoing search for the god particle to prove a standard model that is growing in complexity and particles rather than simplifying into a real theory. The search for truth in all endeavours, be it science, mathematics or engineering becomes less complex and more elegant as one finds the truth. The standard model is a nightmare of increasing complexity that takes us away from the truth. No scientist would say empty space can push back and exert pressure inward toward the solar system. Voyager detected the gravitational field. What is presently postulated as dark matter is aether. Aether has mass and is physically displaced by matter. Aether displaced by matter exerts pressure toward the matter. What Voyager detected is the aether displaced by the solar system pushing back toward the solar system which is gravity. Not true, for two reasons. 1) Beyond the limit of the observable universe, space would be receding from us at a speed greater than light speed, and 2) when we look out to the edge of the observable universe, the furthest point we can see is the universe as it existed just 300,000 years after the big bang – a period known as the “first light”. Thus, if you tried to look any further out, you wouldn’t see anything at all because light was still bound up in the high temperature of the matter that existed then. However, it may well be possible that the universe is infinite. Some scientists have suggested that the event known as “inflation” may be occurring all over the place. So for example, our observable universe arose from inflation that caused a rapid expansion followed by a normal type of space. Beyond that bubble of normal space, there may be other inflations that have happened and are happening now. Incidently, the evidence that supports the big bang is the microwave background radiation which was predicted to be at 2.7k and that is indeed what it is. “Not true, for two reasons. 1) Beyond the limit of the observable universe, space would be receding from us at a speed greater than light speed, and 2) when we look out to the edge of the observable universe, the furthest point we can see is the universe as it existed just 300,000 years after the big bang – a period known as the “first light”. You do not know that, Vince. It is an assumption, right? Therefore you cannot tell Alexander this as a thruth, rejecting what Alexander says. Based on empirical evidence, Alexander’s “thruth” is really more believeable….Because what he says is what allways has happend in the past….Extending the range, and you see more galaxies….again and again, this has happened…. But then, one day, we might not see anything more….but we dont know why…..Yes, I know, the bing bang, redshift, doppler effect, and all that….but tell me; If we can see the velocity of all galaxies, in all directions, we should be able to pinpoint the center where the big bang was? By vectoring all velocities? In that case, where is it? …..Just kidding. Well, the further out into the universe you look, the younger the galaxies also appear, since you are looking back in time. Right out at the furthest reaches – around 13 billion ly – you see only dust clouds, because 13 billion years ago, the first galaxies haven’t formed. This is simply a consequence of the finite speed of light. I never suggested that there was nothing beyond that – simply that you can’t see beyond that. This is not an opinion, but an observation.. In addition I mentioned that the universe may in fact be infinite, but I accept that would be mere speculation. Yes, but the funny thing is that I remember very well all those years that exactly the same was said when we could only see 4 billion years “out”……and it was said in a very confident way, as if this was the thruth, and it proved that the universe was….yes, 4 billion years old. It also proved the big bang, and what have you. A bit circular reasoning, dont you think? It didnt prove that the universe was 4 billion years at all. I admit that I myself believe the big bang theory as being the most probable story, because of the red shift, the speed of light and all that, but, I must admit that when they just substituted 4 with , is it 12 now, and kept the rest, I suddenly realised that most scientists are just parrotting what they themselves learn at school, and arent questioning much. So, where is the center of the big bang? Frankly…. (which is odd as i used to be Frank before I changed my name)….things are getting stranger (which is also a double odd coincidence because my wife says i’m getting stranger by the minute!)!! The embyronic E8 Lisi theory and string/M need A Higgs. And a Anti-Higgs. …………….But then, one day, we might not see anything more….but we dont know why…..Yes, I know, the bing bang, redshift, doppler effect, and all that….but tell me; If we can see the velocity of all galaxies, in all directions, we should be able to pinpoint the center where the big bang was? By vectoring all velocities? In that case, where is it? …..Just kidding. The place where the Universe emminated is near here. not that far—i’ve heard. But can we now get back to work and do some real science. They are not getting stranger. Voyager detected the aether. What is postulated as dark matter is aether. Aether has mass. Aether is physically displaced by matter. Aether displaced by matter exerts pressure toward matter. Gravity is the force displaced aether exerts toward matter. A moving particle has an associated aether displacement wave. The hidden-medium of de Broglie wave mechanics is the aether. In a double slit experiment the particle has a well defined trajectory which takes it through one slit while the associated aether wave passes through both. Simply put: It’s analogous to first-order vacuous waffle. with the lowest possible energy (the ground state of the Hilbert space). As described above, this state is impossible to achieve experimentally. This hypothetical vacuum state often has interesting and complex properties. (virtual particles that hop into and out of existence). It also, relatedly, has a finite energy, called vacuum energy. Vacuum fluctuations are an essential and ubiquitous part of quantum field theory. Some readily-apparent effects of vacuum fluctuations include the Casimir effect and Lamb shift. There can be more than one possible vacuum state. The starting and ending of cosmological inflation is thought to have arisen from transitions between different vacuum states. For theories obtained by quantization of a classical theory, each stationary point of the energy in the configuration space gives rise to a single vacuum. String theory is believed to have a huge number of vacua – the so-called string theory landscape. In the superfluid vacuum theory the physical vacuum is described as the quantum superfluid which is essentially non-relativistic whereas the Lorentz symmetry is an approximate emerging symmetry valid only for the small fluctuations of the superfluid background. An observer who resides inside such vacuum and is capable of creating and/or measuring the small fluctuations would observe them as relativistic objects – unless their energy and momentum are sufficiently high (as compared to the background ones) to make the Lorentz-breaking corrections detectable. It was shown that the relativistic gravity arises as the small-amplitude collective excitation mode whereas the relativistic elementary particles can be described by the particle-like modes in the low-momentum limit. Is there a BIG BANG when these particles hop into and out of existence? Can a Universe simply hop into and out of existence? space and aether is physically displaced by matter. Force exerted by displaced aether toward matter is gravity. This is what Voyager found evidence of. Does any field exist? Electromagnetic, gravitational or otherwise? This debate periodically pops up in the WUWT solar threads where Leif Svalgaard for instance describes the solar magnetic field lines as if they are as real as physical ropes or strings. Do any fields “exist” or are they just gradients of potentials, and is “field” just a kind of imagery to describe them? A field is physics is space filled with aether and the strength of the field is the displacement of the aether from its rest position. There was no Big Bang, and space is not “receding” anywhere. Apparent expansion of the Universe (red shift) is a simple optical effect of curvature. No, the far galaxies do not appear “younger” — they appear so blurred that we cannot see their structure yet, just because they are far away. Them being “younger” is an unsubstantiated myth. If you accept as truth a cosmological theory that needs 11 dimensions as a least common denominator, creation out of nothing, intangible and unprovable dark matter, mysterious dark energy, conservation of energy, motion and inertia laws thrown out of the window, aether re-invented, and a particle that doesn’t exist (aptly named “God particle”), you accept a religious dogma, science has nothing to do with it. Circa March twenty-fifth, zero one. Funny that Dr. Leif Svalgaard doesn’t seem to understand that matter is energy, and vice versa. V. I. Lenin made the same mistake. Field, as I understand it, is a radiating part of energy contained in a matter or in a particle that extends beyond the concentration of energy, which we call “matter” or “particle.” It is only the near-light-speed motion, translational or rotational, that converts energy into “matter.” In the absence of motion (at zero degrees K) all matter (atoms, particles) become waves (radiating energy). If all the energy contained in one human body in the form of rotating fields would be released, it would vaporize the whole Earth into plasma. Aether and matter have mass. Matter is condensations of aether. When a nuclear bomb explodes matter evaporates into aether. The evaporation is energy. Mass is conserved. 1) 11 dimensions. This relates to superstring theory and its veracity or otherwise has nothing to do with the origins or expansion of the universe. 2) Unprovable dark matter. A little background first: It has been observed that stars at the edge of galaxies are rotating at the same speed as those closer to the centre. But as objects orbit further and further out from the centre of a system, they should be orbiting more slowly (as do the planets in our solar system). The only explanation is that there must exist a framework of matter, and that because we cannot see it, must not interact with light. Therefore it was called dark matter. What is your explanation for the anomalous rotation of galaxies? 3) Mysterious dark energy. Again, this is the result of observation. If the universe is expanding at an increasing rate, what could be causing this? 4) Conservation of energy, motion and inertia laws thrown out the window. Not sure what you mean here. 5) Aether re-invented. That was my original skepticism of the Higgs field. 6) A particle that doesn’t exist. May or may not exist. That is the whole point of the CERN experiment. If it does exist then that lends further support to the standard model. If not, then according to Peter Higgs, “I will no longer understand everything I thought I understood. 7) Creation out of nothing. You got me on that one. 8) Science has nothing to do with it. As all these theories are based on trying to fit observation into some kind of coherent model, I would say that science has a great deal to do with it. Arm waving it all away by calling it religious dogma, is not science either. Can you offer any reference to how this curvature creating the appearance of curvature? I’ve never heard of this hypothesis. Is it something you’ve made up on your own? Meant to say in last para above: Can you offer any reference to how this curvature creates the appearance of expansion. This not in an expanding universe then? Could “outside” actually be outside of the universe as we know it? Just as there are molecules with attraction, perhaps our universe has ‘another’ acting on it, or, what appears to be ‘pushing back’ from a rigid boundary might be just our universe in another medium, like a something suspended in water. The Universe spins around a preferred axis because the Universe is, or the local Universe we exist in is in, a jet; analogous to the polar jet of a black hole. The reason for the ‘expansion’ of the universe is the continual emission of aether into the Universal jet. Three dimensional space associated with the Universe itself is not expanding. What we see in our telescopes is the matter associated with the Universe moving outward and away from the Universal jet emission point. In the image above, ‘1st Stars’ is where the increase in pressure caused by the aether continually being emitted into the Universal jet causes the aether to condense into matter. The following is an image analogous of the Universe, or the local Universe, we exist in. The following is an image analogous of the Universal spin. Dark flow is the aether emitted into and propagating through the Universal jet. Dark energy is the change in state of the aether emitted into and propagating through the Universal jet. It’s not the Big Bang. It’s the Big Ongoing. I am a musician and a translator. I cannot impress you with long lists of links to published works in the rather diversified field of cosmology, or with hairy formulas. Nevertheless, I am able to think, and the fact that I am not infected by dogmas prevailing in today’s colleges and universities is rather a positive factor, since scientists are mere humans, and humans, as well as sheep and cattle, always follow the trail to the feeding trough. 1) 11 dimensions are now part of the newest Big Bang theory editions. Fashionable new variations of the Big Bang theory (they are being pushed all over the place, even on TV) are based on the idea of “colliding branes” — that is, they are inseparable from the superstring juggling of formulas. 2) Unprovable dark matter. What is my explanation for the anomalous rotation of galaxies? I don’t have a ready “explanation” for everything. I suspect that the pace of time changes depending on the quantity of mass present, and on the distance from that mass, and this “curvature of time” will serve as an explanation of the anomalous rotation of galaxies in the future. In any case, inventing an intangible “matter” that cannot be observed or registered using any instruments — just to explain something away — doesn’t count as an explanation. 3) Mysterious dark energy. If the universe is expanding at an increasing rate, what could be causing this? It doesn’t. There is no “if” about it. 4) Conservation of energy, motion and inertia laws thrown out the window. To postulate Big Bang, one has to forget about the most fundamental laws of physics. 5) Aether re-invented. Seems that we don’t have a disagreement on this point. 8) Science has nothing to do with it. It has been a long time since the Big Bang theory doesn’t fit observations. Recent discovery of a super-massive cluster of galaxies at the “edge of the visible Universe” where, supposedly, only smaller “young” galaxies could exist, is one more nail in the BBT coffin. Apparent expansion of the Universe (red shift) is a simple effect of curvature. David F. Crawford’s Curvature Cosmology, Segal’s Chronometric Cosmology, Fred Hoyle’s critique of the modern “consensus” in cosmology, recent rapid back-pedaling by Stephen Hawking on the validity of the BBT, and Mandelbrot’s rebuttal of Olson’s paradox could give you an idea about where, approximately, my thinking is coming from. We don’t have yet (and may not have in out lifetime) a cosmological theory that fits all the observations. We have a smorgasbord of incomplete and imperfect theories, from which we are free to chose the one that, in our perception, is the closest to reality. The Big Bang theory is a dogmatic exercise in extrapolation of the anthropocentric, illogical, irrational, creationist basic principle. Mike, thanks for all this information, I’m finding it quite fascinating. Don’t see how “preferred axis” correlates to the “jet” though, the ‘trumpet’. What I’m getting from those descriptions is a flow back possibly simply an orbit around a central point. Wouldn’t that fit with the more right spinning as observed from the northern hemisphere and more left spinning observed from the southern? Could, also possibly account for the anomaly in the red shift, that younger galaxies being found further away and in an ‘expanding’ having blue shifts showing velocities towards us somehow overriding expanding away from us red shifts. I hope I’m explaining myself well enough, it’s very difficult to type, my keys have been hijacked again, and I’ve only just found that the big bang sets up empty space in the middle .. which seems very odd. Although like apples perhaps. The reason for the ‘expansion’ of the universe is the continual emission of aether into the Universal jet. Three dimensional space associated with the Universe itself is not expanding. What we see in our telescopes is the matter associated with the Universe moving outward and away from the Universal jet emission point. In the image above, ’1st Stars’ is where the increase in pressure caused by the aether continually being emitted into the Universal jet causes the aether to condense into matter. Not that I’ve got anything against trumpets, or a host of them dancing in the breeze, hmm, I think Imight try painting that one, but what is the ether being emitted from ? What do you mean here? What is dark energy then? Is this the plasma that is said to have been at the beginning opaque to light? Could the dark flow be the movement of a medium in which the clusters are orbitting/spinning around axis? Yes dark flow is a medium in which clusters orbit and spin around axis. Dark flow is the state of the aether emitted into and propagating through the Universal jet. There are a bunch of objects flowing downstream in a river. At the mouth of the river the objects move away from each other. Now spin the water and this is analogous to the Universal jet we exist in. Just as a black hole continually emits what it pulls in into its jets the Universe continually pulls in what it emits into the Universal jet we exist in. The big bang did not create matter or antimatter. Singularity was all the energy-mass of the universe. Matters and Antimatters are big-bang follow-up evolutionary, circumstantial-accidental expansion collision products. At 10^-35 seconds since big bang, D was already a fraction of a second above zero. This is when gravity started. This is what started gravity. At this instance started the energy space texture, the straining of space texture, the space-texture-memory, gravity, that most probably will eventually overcome expansion and initiate impansion back to singularity, again. Glad to see that the science at CERN and their scientists is consistent wtih the groundbreaking work and discipline of the majority of climate sceintists. For those who have mentioned the CLOUD project which I find very interesting, can you direct me to a legtitimate study that shows how their initial findings correlate to observed conditions over the past several decades?